Bizerba sharpeners are separate units representing no hygiene risk during sharpening. Of course, same as with all other removable parts, this sharpener can be cleaned in the dishwasher. 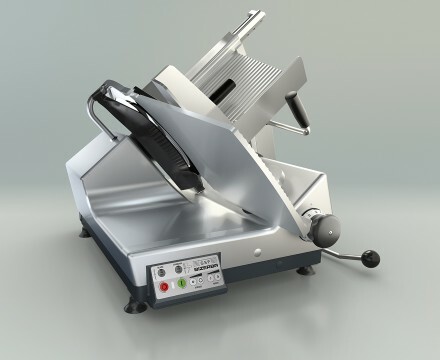 Sophisticated design, careful material selection and elegant solutions such as a lifting device for quick and easy cleaning by hand underneath the slicer. The automatic carriage drive with servo support for manual operation reduces operator fatigue and allows the operator to concentrate on the shopper. Positioning in different heights towards center of blade depending on slicer version. Height: 195 mm / 7.7"
Width: 195 mm / 7.7"